This digital painting took approximately 5 days start to finish. I used photoshop standard brushes with only a couple of textures and the odd custom brush. I took many snap-shots throughout and so rather than having one huge animated gif showing my process I thought I’d split it up into a few chunks and talk in more detail about each chunk. This stage is painful. You have the image composed and posed in your head – now to find the reference to go with it… but it doesn’t exist! At least it’s not going to be found deliberately under obvious search terms. I tried searching for ‘cape’ and got a ton of pictures of tropical islands. I tried search for ‘cloak hood’ (or cowl etc) and got pictures of muscle cars!? Go figure. In the end you have to exhaust all your photo reference avenues until you find something that you can work with, even if it’s not ideal. Either that or bite the bullet and get someone to pose for you. If you read James Gurney’s Imaginatve Realism you’ll see various techniques and ideas for this, but one thing is certain – the masters still use good reference. Only difference is that they probably deviate more from the ref because they have enough experience. There was much more gathered but these images influenced most of the painting. 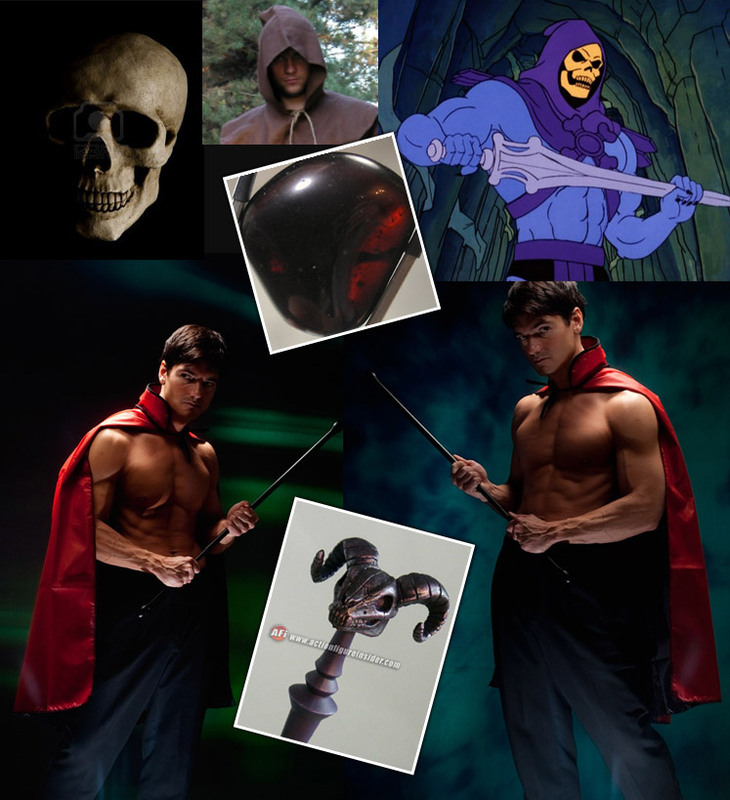 The guy in the cape can be found here and has a useful deviant art account for muscular anatomy reference. It’s also well lit – something 90% of stock providers don’t seem to understand. I started with the background where I built up layers of chalky/stoney brushes to create that ‘portrait background’ look. This is something I tend to do with reference i.e. photoshop it together to save screen space and to have it all in one shot. I had these two side by side on my screen and carefully lined everything up for accuracy. At this stage it’s about getting measurements, proportions and distances correct. You’ll notice the pushing and shoving of body parts here. At the above stage I’m always vulnerable to thinking it won’t turn out right as it’s such a messy stage. So what I do (and this is just me) is I block something in that is highly detailed and finished so I can feel confident in the general rendering. Not something other artists tend to do but it makes me relax a little because I can look at part of him that is poorly rendered and assure myself that all I need to do is spend the same energy on that part as the well rendered part. I picked his top hand for this as you can see from the first animated gif above. Carrying on the principle above I went to work on the other hand/arm. Veins were tricky and to prevent them sticking out too much (as per the reference), I went over them with a medium tone to knock them back. I had been avoiding his head this whole time and so once the arms and torso were largely complete, I figured it was time to get stuck into the head. Reference was very limited to the cowl/skull so it was daunting. It’s worth noting at this stage that I was mainly using standard brushes. Previously I’ve used a wide range of brushes but I just find that a good airbrush/solid brush works really well. Maybe that’s because I’m working with flesh? The head just took a lot of improvising. Kinda wish I had a decent skull to work from. 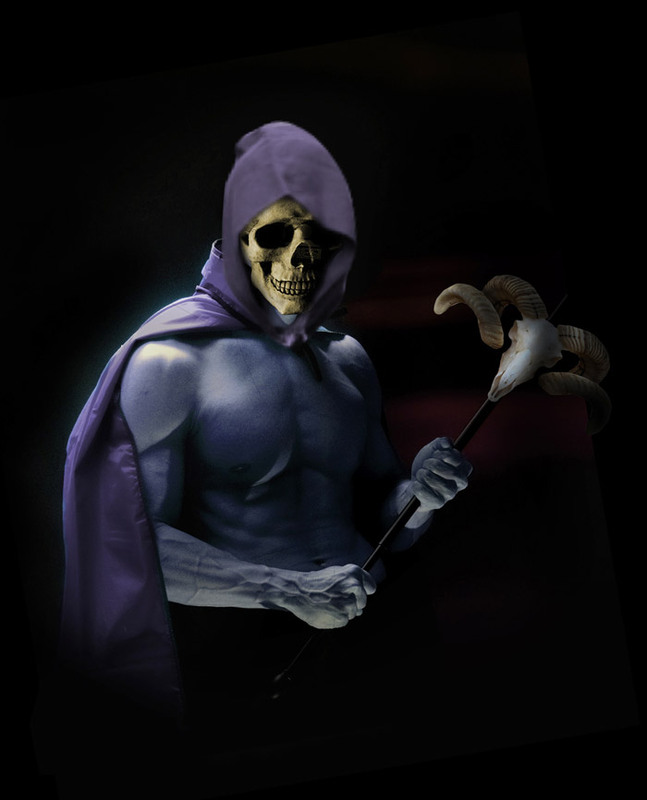 But even then, skeletor has a distinctive look to his skull if you look at the reference. I wasn’t keen on the way the cape was hanging on him so went back to my reference and realised that, lucky enough, I had two poses, one of which had the cape off his arm. I went about painting in the back of the arm so I could hang the cape over as much of it as I chose. The cape turned out nice as a rough, furry hessian fabric with loose thread. Aged. I also put a hessian texture over the top. In previous paintings I’d used the pen tool to create shapes but this time around I wanted to push my boundaries and go free hand. The one exception was the chest strap thingy where a fair bit of pen tooling was used. For the stiching I made a line with the pen tool and stroked it, then erased gaps in the line to make it look like thread going in and out of the leather strap. Then a leather texture was applied to it. The staff was a nightmare as it was hard surface, inorganic and at an angle. I just had to plough through and tweak it until it looked straight and plausible. I also had a big problem with the staff in terms of it competing for his head in the composition. So I only partly lit it and had it go slightly out of frame. In future it would have been better to improvise a shorter staff with maybe just a jewel in the end rather than a large ram’s head. Hope you enjoyed this digital painting tutorial. Do keep coming back for more! Comments welcome… which characters would you like to see? 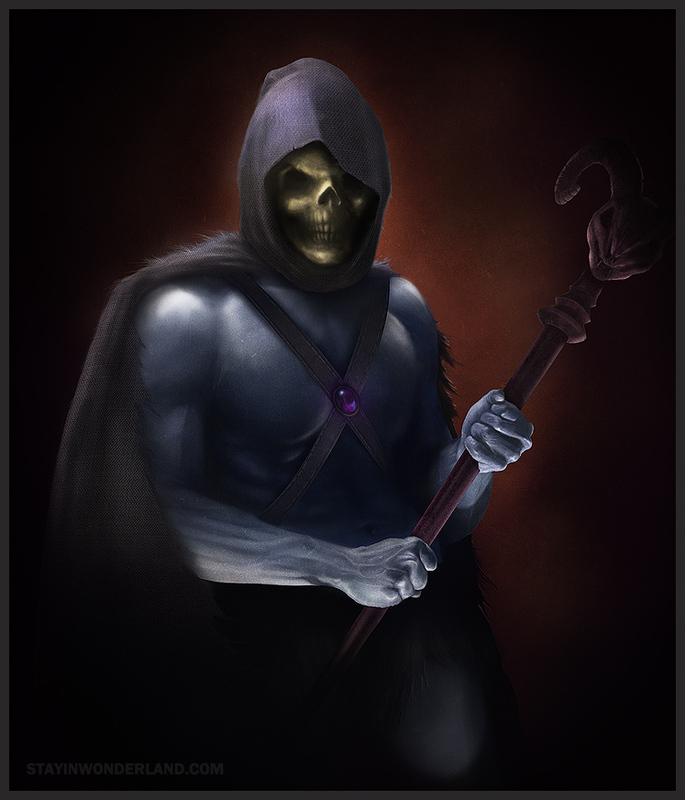 This entry was posted in Digital Painting Tutorials and tagged digital painting, digital painting tutorial, he-man, masters of the universe, MOTU, painting, photoshop, retro, skeletor. Bookmark the permalink. Great work and I love the look. 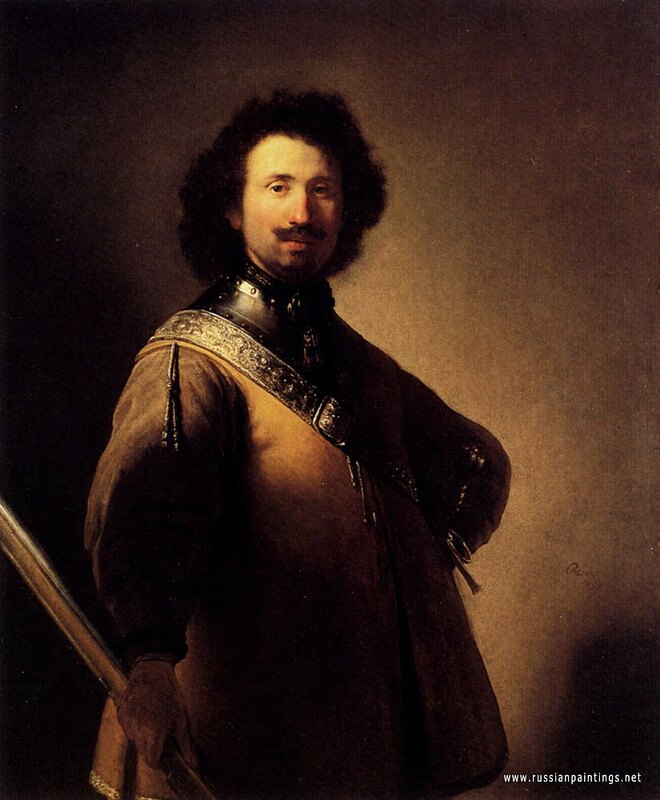 I was wondering how you achieved the hessian style fabric effect on his brush. Any tips on brush settings or were these pre made? I’m attempting to re-create something with a similar effect. hey there. Well, I think I just googled: hessian or something and then overlayed it. Pretty simple! 🙂 good luck and thanks for dropping by.